Home > Uncategorized > Did you ever notice…? It matters not the time of year, nor the reason why. 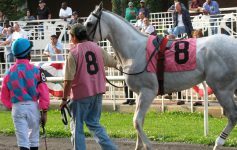 But any mention of Saratoga and Horse Racing anytime outside the racing season always brings me a feeling of warmth and peace knowing I will return to her. It may be nine months away, but she remains so close in my heart and I can see her clearly in my mind’s eye. Such an instant occurred when a friend emailed me a link to a segment on last Sunday’s 60 Minutes. Veteran newsman Andy Rooney waxed eloquent, as he will and as he might, about the movie Secretariat. An admitted novice at best when it comes to being a racing fan, Rooney talks of how his parents were raised in nearby Ballston Spa. He tells us his visits to Saratoga were annual jaunts for nearly each of his 148 years on earth … ok, 91 but wow…still…that’s more than a few. In it he talks of how he’s seen some of the greats, and for a novice the man has seen the greats. He’s seen Whirlaway, Secretariat, Jim Dandy and Citation. Seattle Slew, Dr. Fager, War Admiral and Man O War. Then I started thinking…Man O War? Wait a minute. How old IS Andy Rooney anyway? I looked him up. Born January 14, 1919, he would have been an infant when racing’s first Big Red raced and barely two when he showed the world that he could carry 138 pounds and still win. Then I thought, you know, maybe I oughta cut the fella a little slack. He’s forgotten more than I’ve seen and was blessed to visit the Spa during a time I have only read about. A time when, truly, I would have loved to live. Simpler. No lotteries or huge casinos to stunt the racing fan population. Men knew to open doors for women and tip their hats, as they’d walk by. Gentler. More polite. A time when men would wear a tie and a hat to the races, when please and thank you were common place. But still, as a writer of The Saratoga Special often says to his friends and writes in his paper, THESE are our good old days. Let ’em roll, then baby. Let ’em roll. And Andy, thanks for the warming mention of Saratoga as the chill of winter knocks at our door. I just found your website and read your 11/12/10 Andy Rooney piece. Knowing that Man O’ War ran in 1919, I too thought,”how old is that guy?”! I got such a kick out of the backstory about his parents being from Ballston Spa. Who knew?! 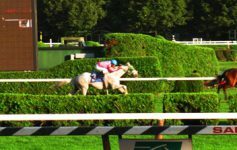 Your description of how the mention of racing and Saratoga brings warm feelings any time of year is exactly what I’ve experienced regularly since 1978 when I was relocated to Florida by my then employer, GE Capital. I’ve managed to come home several times for The Travers but not as often as I’d like. In my mind’s eye, everything is the way it was back in 1960 when, as an 11 yr old, shining shoes on Broadway or working on the Steeplechase Crew in the Infield from 1965 to 1970. Though there have been many changes in the physical Saratoga, I can always return by closing my eyes and remembering being there. Thanks!